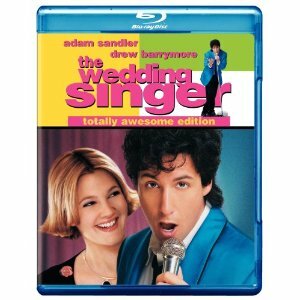 WorldMovieStore - The Wedding Singer Sinopsis. It's a schizophrenic film about a seemingly schizophrenic wedding singer (Sandler) who's charmingly sweet to some people but a tongue-lashing maniac to others, probably out of frustration over his fading ambition as a wannabe rock star (not to mention Sandler's penchant for loud-mouthed lunacy). When he meets an admiring young waitress (delightfully played by Drew Barrymore), its love at first sight, complicated by their pending marriages to much less appealing fiancés. --Jeff Shannon. Read More Sinopsis. 0 Response to "Blu-ray Release The Wedding Singer"